Thanks to KenH for the draft report draft and image processing. 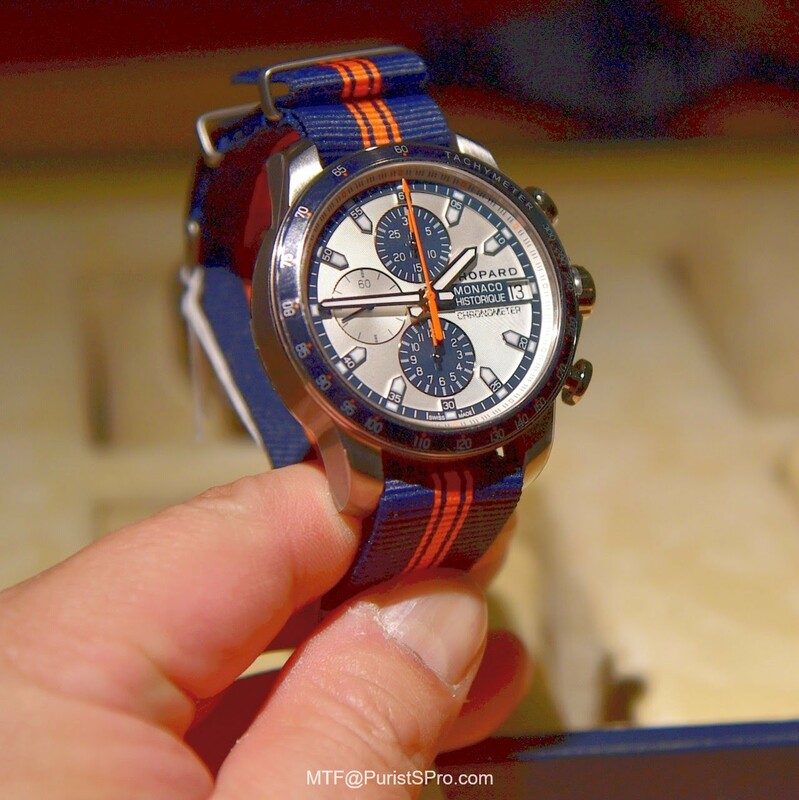 I append LIVE hands-on photos of the watches and post on his behalf as he is travelling. The most prestigious event on the classic racing circuit is scheduled for the 11th edition from 11th to 13th May 2018. 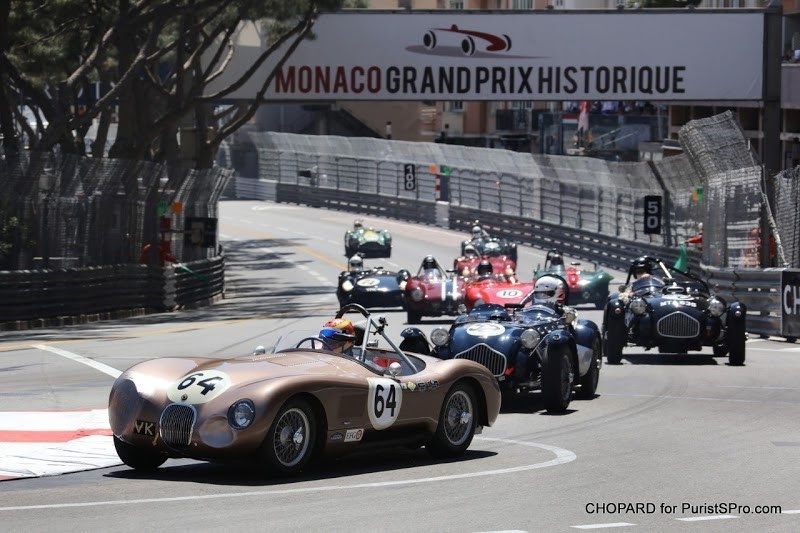 The Grand Prix de Monaco Historique unites drivers and devotees of historical racing cars for competition speed trials. 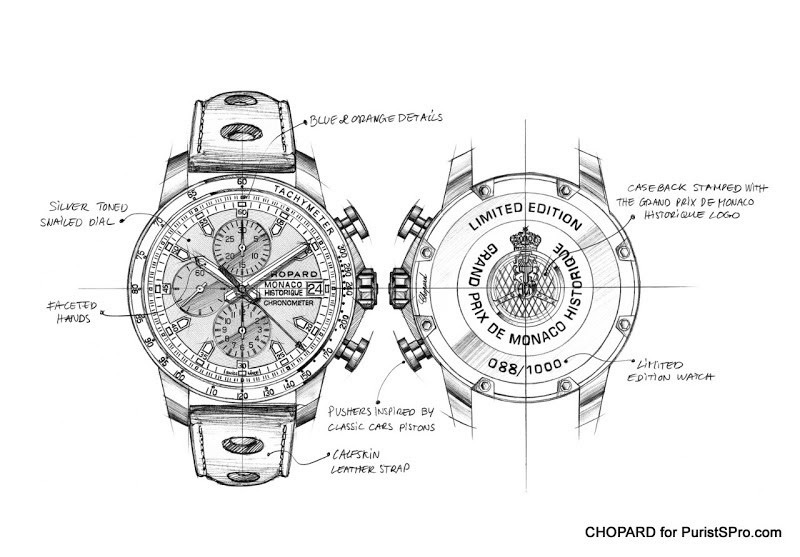 Chopard is its sponsor and official timekeeper since 2002, a natural alliance for a company steeped in racing passion. 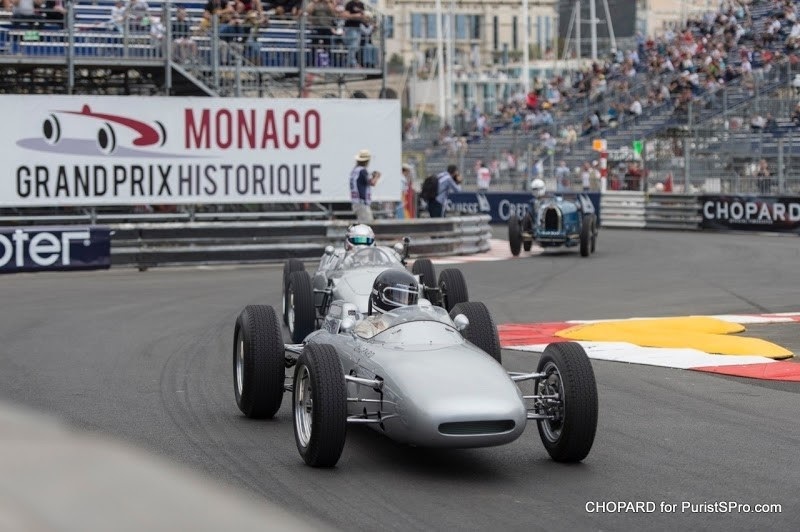 A key fixture on the classic racing calendar, the Grand Prix de Monaco Historique attracted Chopard Co-President Karl-Friedrich Scheufele. 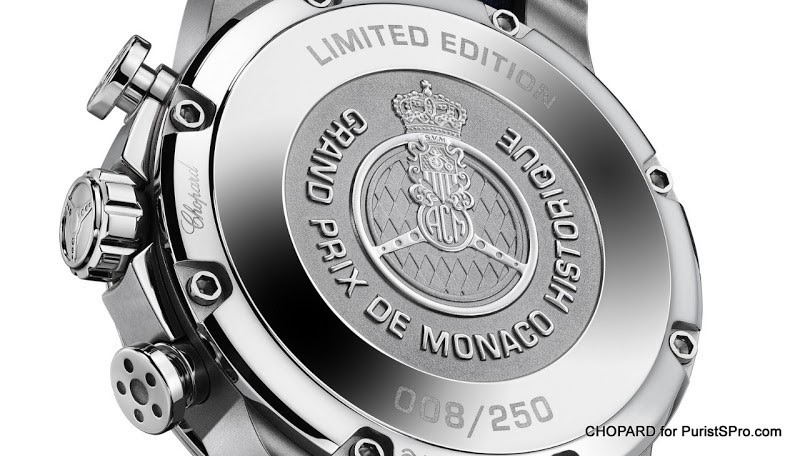 In 1992, his passion for these speed machines – with their high-precision mechanical engineering equalled only by their splendid designs – led him to make Chopard principal sponsor and official timekeeper of the Grand Prix de Monaco Historique. A commitment synonymous with a collection of Chopard timepieces featuring refined details inspired by this exceptional universe and entirely in tune with the virtues of this Grand Prix: endurance, precision, sturdiness… and elegance. 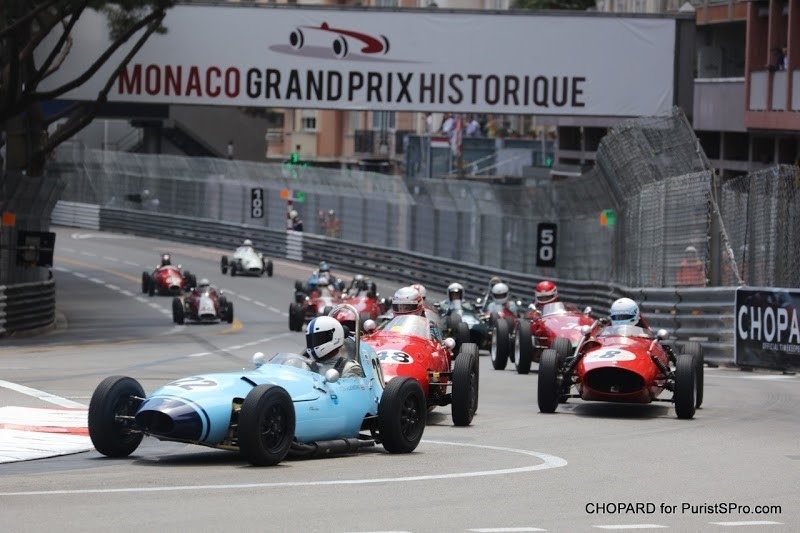 Held every two years, the Grand Prix de Monaco Historique adheres to the exact route of the F1 Grand Prix, where 50 years of motor racing history converge on the ‘Rock’ to compete. Drivers engage in fierce battles at the wheel of collector’s cars assigned to one of seven categories. Aficionados of fine mechanical engineering revel in the wide variety of cars from the finest automotive manufacturers. Offering a splendid retrospective look at models from the pre-war period to 1976, the competition is held on the circuit of the 2018 Formula 1 Monaco Grand Prix, which takes place a fortnight later. 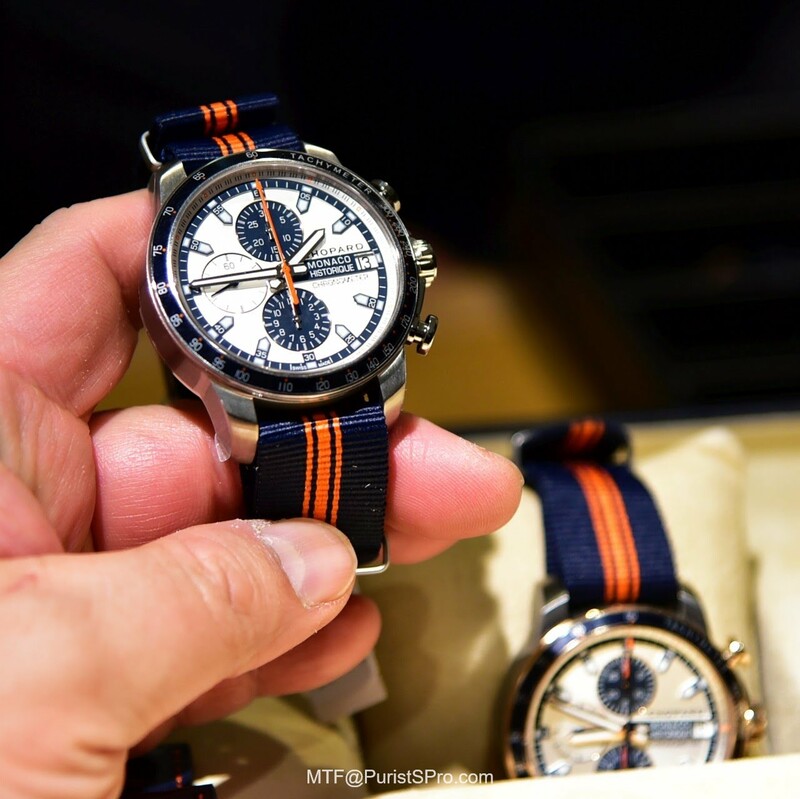 For the 11th edition of the race, an exclusive new chronograph – the Grand Prix de Monaco Historique 2018 Race Edition – honours the daring spirit of this intense and much sought-after race of which speed is the very reason for being and victory a question of panache. 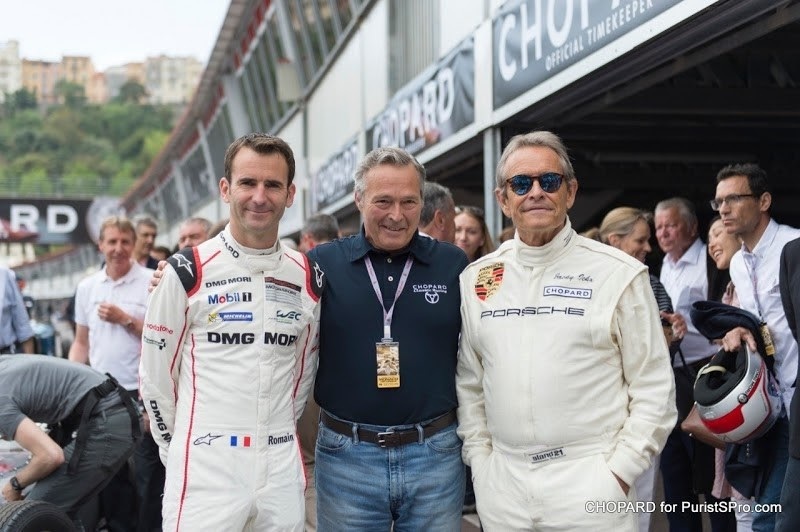 The Chopard GPMH collection welcomes two new limited-series Grand Prix de Monaco Historique 2018 Race Edition chronographs. These ultimate driver’s instruments are powerful, sporting and sophisticated watches that pay tribute to the 11th edition of the race. 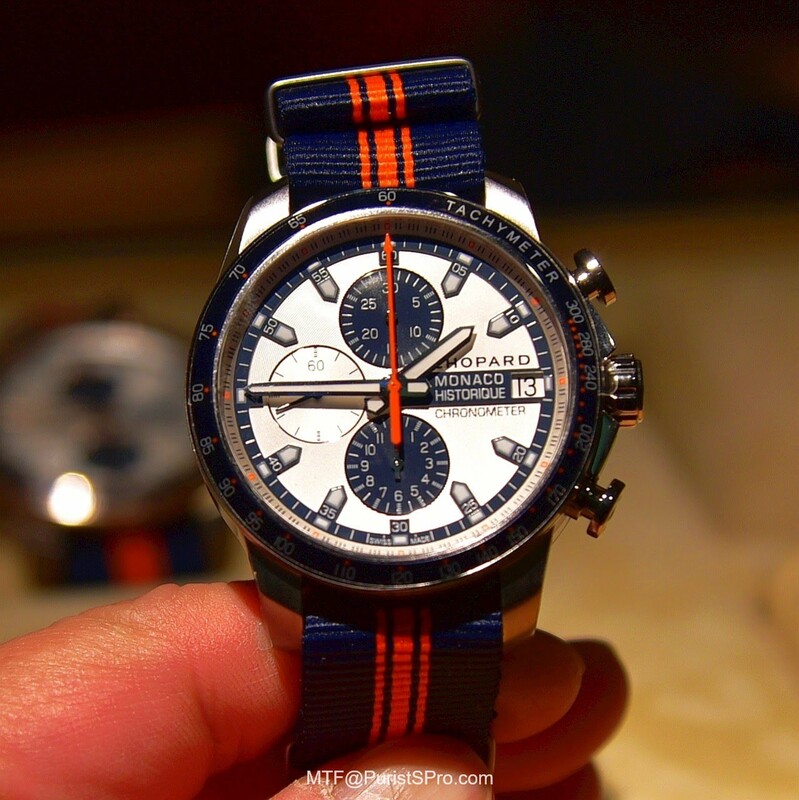 Bodywork inspired by classic racing cars; an ‘engine’ chronometer-certified by the COSC; bright orange or blue accents: these chronographs are a distillation of mechanical refinement, precision and vintage design. 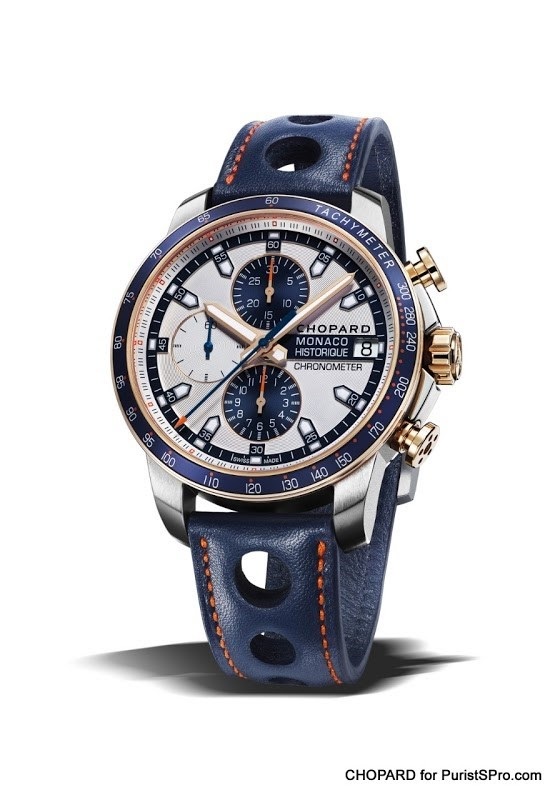 Issued in two limited series – one of 250 in bead-blasted titanium and steel and the other of 100 in 18-carat rose gold, bead-blasted titanium and steel – they embody Chopard’s passion for racing as well as its high watchmaking standards. Inspired by the design codes of classic cars, its daring aesthetics as well as its high-precision mechanical engineering match the adventurous spirit of the participants in this speed race. 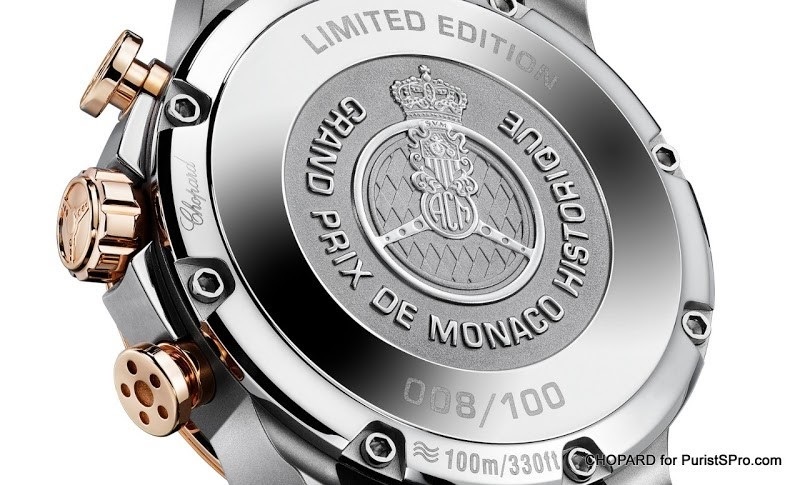 Topped by pushers shaped like engine pistons and a blue bezel with a tachymeter scale for calculating average race times, the 44.5 mm-diameter case is fitted with a screw-lock crown and a caseback stamped with the Automobile Club de Monaco logo. The latter is secured by screws reminiscent of automotive bolts. Water-resistant to 100 metres, it houses a high-precision watch ‘engine’, chronometer-certified by the Swiss Official Chronometer Testing institute (COSC), an indispensable quality for a Chopard chronograph. This mechanical movement with automatic winding, endowed with 46 hours of autonomy, also powers the hours, minutes, seconds, chronograph and date functions. The legible snailed silver-toned dial is enlivened by luminous effects created by the blue and silver-toned chronograph counters. The minute track is punctuated by characteristic applied arrow-shaped hour-markers painted with Super-LumiNova®. 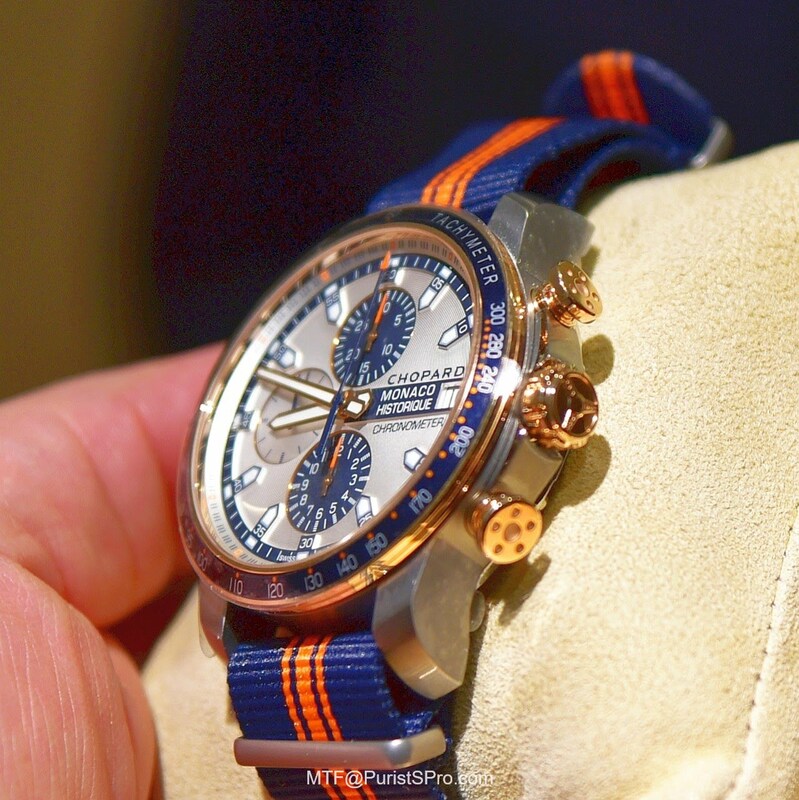 The bright orange sweep-seconds hand of the titanium/steel version and its orange-tipped blue counterpart on the 18-carat rose gold, titanium and steel version mark off the precious seconds of the race. 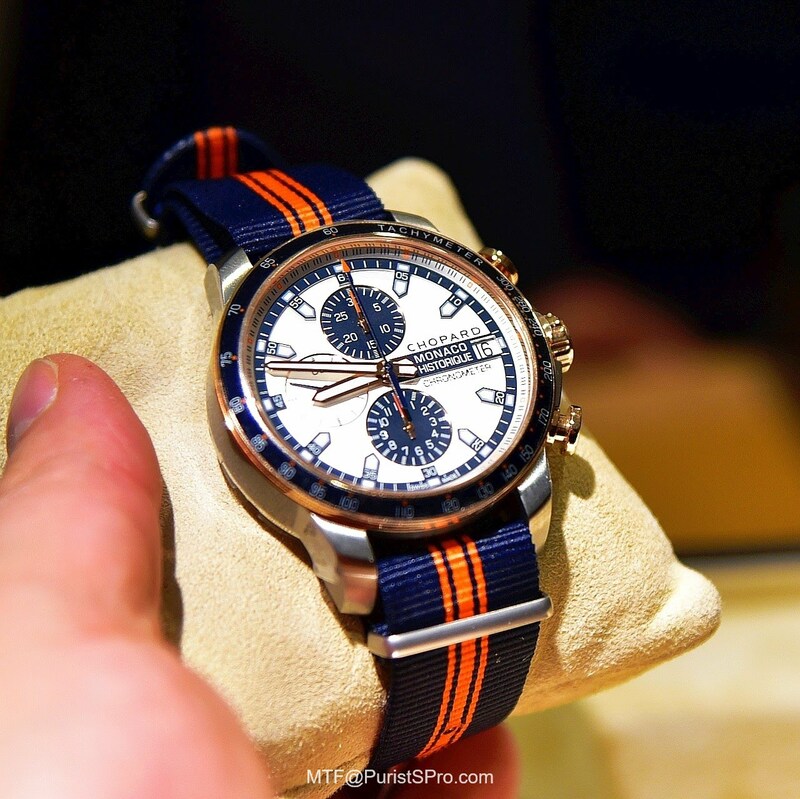 Two interchangeable straps set the perfect finishing touch to the sporting nature of these new timepieces: the blue Barenia calfskin strap with orange stitching for a vintage elegant look; or the blue NATO strap enhanced with orange racing stripes for a casual sporting style. 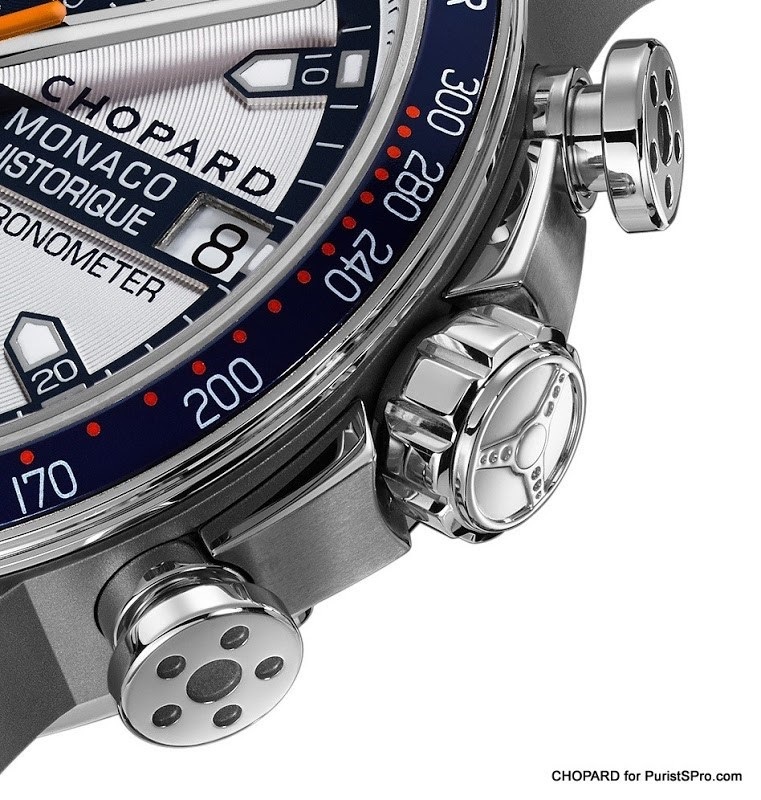 That is exactly how Chopard views racing: performance matched by mechanical excellence and faultless ergonomics, teamed with the aura of elegance inseparably bound up with the world of gentlemen drivers. Grand Prix de Monaco Historique 2018 Race Edition 250-piece limited edition in titanium and steel. Fantastic cars. A racing museum on the track. Interesting photos as they are not all from this years Historic Race. Thank you for your reply.… I meet with Jacky yesterday evening. He is a legend.